Duna da Praia - Macaneta Accommodation. Want to escape from the hustle and bustle of the city?? Beat the city blues and head for sunny Mozambique. Mozambique today is a nation that has undergone fundamental, economic and social transformation. Mozambicans are proud, courteous, mindful of good manners and are among the friendliest people of the world. Duna da Praia our resort is a real bush camp and is situated in the tropical coast of Mozambique on a beautiful island called Macaneta, in the district of Marracuene, 35 kilometres north of Maputo. The combination of the Nkomati River, Indian Ocean and the beautiful long empty beaches of Macaneta, makes Macaneta well worth a few days visit. To get to the island you must cross the Nkomati River by ferry which operates from: 6am-18:00pm. To reach our campsite you need a 4x4 or at least a 4x2 diff-lock the road is very sandy. The ambience of the island is relaxed and intimate. Colourful shrubs, hedges and flowering plants compliment the feeling of peace and isolation. 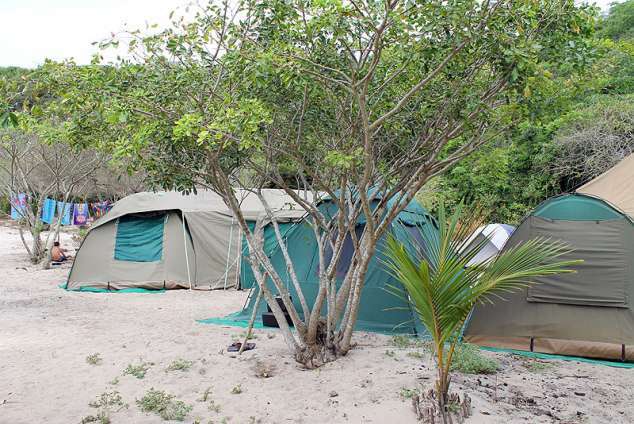 Secluded campsites are hidden among the dune bush adjacent to Macaneta beach. Electricity is supplied by a quietly humming generator which operates from 6-10 in the morning and 6-10 in the evening. If campers will make use of a plug point they must bring an extension cable of at least 15 meters, they are also welcome to bring their own generators. Each campsite is equipped with running water, electricity and a braai with a grid. As our camp is still very new and all the phases is not develop yet, for the moment our facilities include 14 separate bathrooms completely private with hot water showers and flush toilets, 17 campsites , our pool is still under construction. We has a onsite bar were we serve ice cold drinks, because of the warm weather and the fact that water is scares in Mozambique there is a slogan that goes like this:'Don't drink water instead have an ice cold beer'. The beach is flanked by a line of dunes covered in dense undergrowth, making access possible only were lodges or camping resorts have cut a path-open. Access to the beach from Duna da Praia is only a few meters. For the fisherman pelagic fish such as anchovy, barracuda and sardines are found throughout the shallow coastal waters of the broad Mozambique channel. In deeper waters tuna, marlin, sailfish ect. occur. "TO HAVE SOME FUN IN THE SUN"
8381 page views since 03 Aug, 2012. Last updated on 17 Sep, 2018.